Learning to surf in Barbados is safe and fun. Our surf breaks are beginner friendly. Zed’s Surfing School at Surfer’s Point offers surfing lessons and surf tours using the industry’s best surfboards to ensure safety and quality. 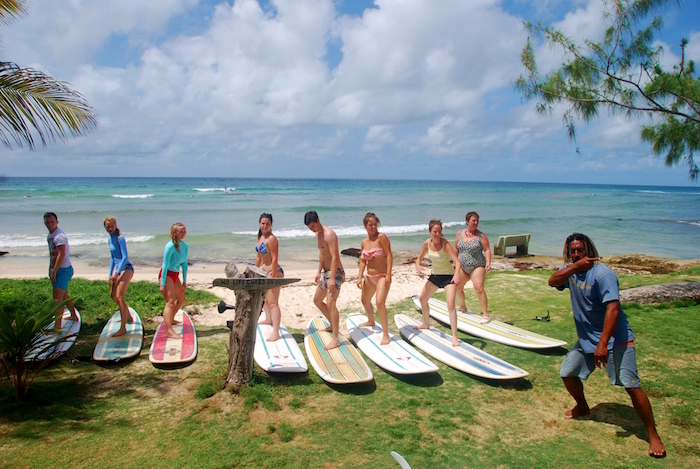 Our group surf lessons run daily from 10AM to 12 pm daily. Each surfing lesson is 2 hours long. We go through the basics on the beach for roughly 20 minutes and then the balance of the time in the water with an instructor guiding you through all the steps and keeping you safe. We pick you up from your hotel or villa (South Coast only) and bring you to our location, choose boards to suit your height and weight and when the surf lesson is finished we drop you back. Zed has been mentioned in the NY Times, Conde Nast Traveller, Times Online, Fox and Friends and has topped the Tripadvisor.com rating for the best surf attraction in Barbados. Most recently Zed’s Surfing School in Barbados was named one of the Top 10 Best Surfing Schools in the World. If it is a surf holiday or surfing vacation you are looking for then Barbados is the best choice you can make.